Banner Size: 39" x 59"
Full-color digital printing on both sides of the banner create a captivating display. Black nylon carrying bag included for transporting the folding banner to and from events. 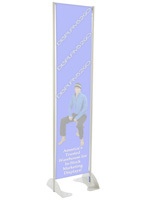 Ground spike ensures the display stays secured in position, even in moderate winds. 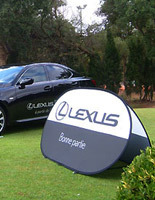 This popup folding banner is a unique alternative for advertising outdoors. Unlike many sidewalk signs or retractable trade show displays, this sign is exterior and interior-rated for advertising anywhere. 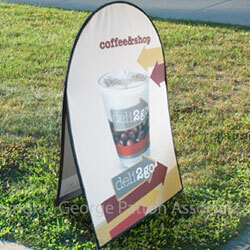 Additionally, a lightweight fabric construction makes this folding banner a-frame easy to setup virtually anywhere. A black nylon carrying bag is included with purchase, which not only makes transporting the unit too and from events simple, but it also ensures all the components stay organized and reduces the risk of losing a piece. Ground spikes are included for anchoring the a-frame folding banner into grass-covered areas outdoors. Hook and Loop distancing straps ensure the unit stays upright and properly expanded when on display. Once set up, the folding banner that is a popup a-frame has overall dimensions of 39-1/3"w x 59"h. The upright, vertical orientation of this event display is another feature that differentiates it from similar products on the market. 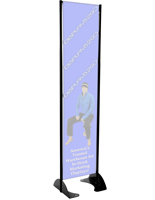 Not only does this folding banner a-frame have a long list of user-friendly features, but it comes with premium quality graphics. 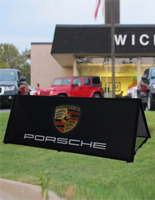 Both sides of the sideline a-frame display have full-color, digitally imprinted custom artwork. 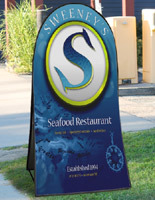 Businesses can customize this folding banner for outdoor events with detailed graphics, featuring near photo quality. 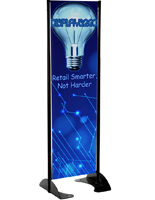 This is a decisive advantage over similar displays imprinted with only heat-transfer vinyl or silkscreened graphics. 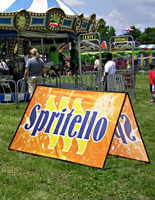 The price of this folding banner that is a portable a-frame includes the cost of customization! Customers can simply click the link below for artwork templates, and then follow the simple and straight-forward submission process. Each exterior-rated folding banner has all the effectiveness of bulky sidewalk signs and retractable banner stands, but none of the hassle. 39.3" x 59.0" x 13.8"
42.0" x 1.0" x 26.0"